Exterior: stageless telescoping handle, patented Multiwheel® system, two TSA combination locks, one leverage lock, and an Add-a-Bag strap; locks and handle on right side. Interior: garment sleeve, laundry bag, and shoe bag. Approximately 17.5"W x 10.25"D x 26.75"T.
In the beginning, Richard Morszeck and his father, Paul, lost most of their luggage factory materials to a fire, leaving only the stocks of aluminum untouched by the blaze. In 1937, Morszeck subsequently developed the first suitcase made of aluminum, combining the lightweight metal with high-durability grooves. 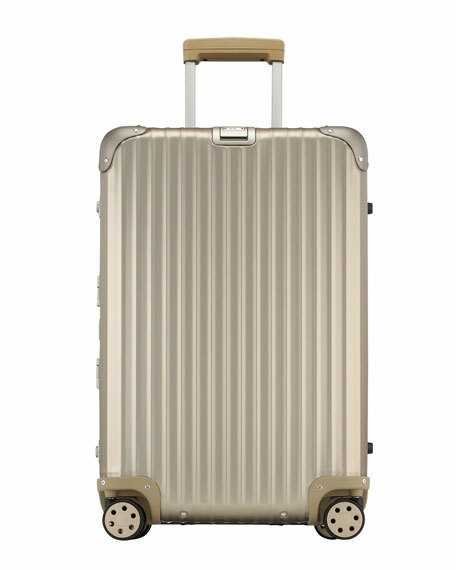 Today, in addition to the classic aluminum luggage and suitcases, RIMOWA also features polycarbonate luggage formed with the same classic groove structure. Headquartered in Cologne, RIMOWA has factories in Germany, the Czech Republic, and Canada. For in-store inquiries, use sku #1584216.